A fighter of Syrian opposition stands at a checkpoint in northwestern city of Idlib, Syria, Oct. 13, 2018. Syria’s largest surviving rebel stronghold, Idlib, faces a complex, uncertain and possibly violent future. Right now, a deal between Turkey and Russia is holding off Syrian military action to recapture this area. U.S. and U.N. officials say there are tens of thousands of militants active in Idlib. The top U.S. military officer, Chairman of the Joint Chiefs of Staff Gen. Joseph Dunford, said a large-scale military operation to recapture the province could result in many civilian as well as military deaths. “I’m suggesting that counterterrorism operations should take place in a manner that mitigates the risk of the loss of innocent life,” Dunford said. In August, Staffan de Mistura, the U.N. Special Envoy for Syria, said there are many foreign fighters among the militants in Idlib who could use chlorine gas as a weapon and make a military operation horrific. As part of the deal struck between Russia and Turkey, rebels were required to remove their heavy weapons from a buffer zone between the Syrian government forces and the rebels by Oct. 15. The deadline passed and both the rebels and the militant groups are still present in the province. 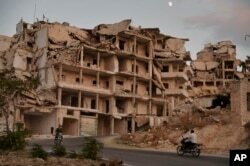 The Britain-based Syrian Observatory for Human Rights group, which follows developments in Syria, said Monday that Syrian government forces had exchanged fire with rebels Sunday. In this Sept. 20, 2018, photo, motorcycles ride past buildings destroyed during the fighting in the northern town of Ariha, in Idlib province, Syria. Ariha is one of five main towns in Idlib province and the last place to fall to rebel control in 2015. Idlib, in the northwestern part of the country, is home to an evolving group of active jihadist groups, including Hayat Tahrir al-Sham (HTS), Hurras al-Deen and Turkistan Islamic Party. “HTS has the capability to continue to weave itself in the social and political structures of Idlib, and that will take concentrated and huge efforts from Turkey to remove HTS,” Nicholas Heras, a Middle East expert at the Center for New American Security, told VOA. HTS is the strongest jihadist group in the province. Hurras al-Deen is an offshoot branch of HTS with links to al-Qaida and the Turkistan Islamic Party, which is made up mostly of Chinese Uighur militants. HTS was formerly known as al-Nusra Front and was an affiliate of al-Qaida in Syria. In 2016, the group said it cut ties with al-Qaida and named itself as the Jabhat Fateh al-Sham. In 2017, the group organized an alliance with several other smaller militant groups and renamed itself HTS. The U.S and EU still consider HTS an al-Qaida-affiliated terror group. Al-Nusra Front has changed its name, but the U.S. State Department said it remains a menace. “Whatever name Nusra chooses, we will continue to deny it the resources it seeks to further its violent cause,” Nathan Sales, the U.S. State Department coordinator for counterterrorism affairs, said. HTS, which was somewhat open to the Turkish-Russian deal, did not say that it would act on it. “We appreciate the efforts of those in the inside and outside who are trying to protect the free area in Idlib,” HTS said in an Arabic statement released a day before the expiration of the deal. “We warn against trusting the devious Russian invader,” the statement added. Ahmed Abazid, a Syrian analyst, believes that HTS is being deliberately vague. “HTS fears a Turkish reaction and a local reaction against it because the people were afraid of a Russian campaign in Idlib, and (the) Sochi agreement came to save Idlib from a humanitarian disaster,” Abazid said. Abazid added that HTS leader Abu Mohammad al-Julani is keen to establish a local authority in Idlib and his group would not give up on that goal easily. Despite the obstacles, Syrian government officials say they prefer negotiation over confrontation. Syrian Foreign Minister Walid al-Moallem said last week his government gave its ally Russia more time to deal with the rebels. Dmitry Peskov, a Kremlin spokesperson, acknowledged difficulties with fully implementing the agreement, but said the deal is still in place. “Of course, one cannot expect everything to go smoothly with absolutely no glitches, but the work is being carried out,” Peskov told reporters in Moscow last week. Newly displaced Syrians arrive to a refugee camp in Atimah village, Idlib province, Syria, Sept. 11, 2018. Turkey, which has helped broker the deal, benefits by the prevention of a major conflict in Idlib. Ankara backs the National Liberation Front, an alliance of pro-Turkey rebels in the province, and a major military attack by the Russia-backed regime forces would hit those forces as well. Idlib also shares a border with Turkey and any large-scale military operation would push hundreds of thousands of civilians into Turkey, which already hosts about 3 million Syrian refugees. But Colin Clarke, a senior research fellow at the Soufan Center, a New York-based think tank, said Turkey may also have a hidden agenda. “A secondary objective is certainly for (Turkish President Recep Tayyip) Erdogan to see if he can redirect HTS fighters toward fighting against Kurdish groups like the YPG,” Clarke told VOA, referring to a U.S.-allied Kurdish group that fights the Islamic State. Turkey views the group as a wing of the outlawed Kurdistan Workers Party (PKK), a charge denied by the U.S.